My guitars are built using the traditional Spanish method involving a ”solera” which allows to setup guitar body and neck in a free manner, like a ship is built in a dry dock. Finest quarter-sawn wood material available is used, such as East Indian – and Honduran Rosewood, European Maple, American Monterey Cypress for the back and ribs. 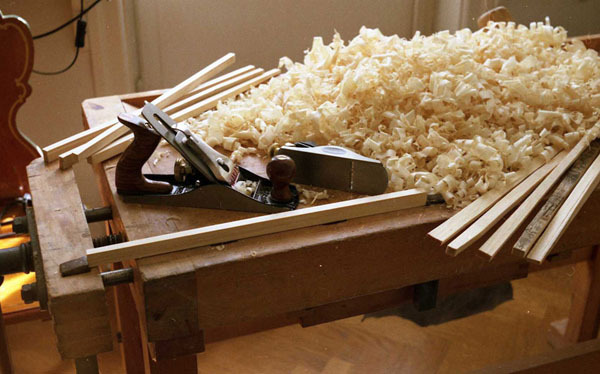 Sound boards are usually made from master grade Alpine Spruce from Switzerland, Western Red Cedar or common Cedar. Wood for the necks can be Spanish Cedar, European Cherry, Flamed Maple or African Mahogany. Fretboards are exclusively made from Macassar- or West African Ebony. To build a concert guitar takes at least 200 - 250 hours. Usually I build 2 – 3 guitars of the same design but different wood combinations in parallel, which means that each guitar stays for about 3 – 5 months in the workshop until it can be strung up and the action set. The workshop has humidity control, relative humidity is held in between 40 – 65 %, which is an optimal range for all musical instruments made of wood. Each part of the guitar plays a role in the production of sound: in particular the soundboard (top), the back plate and, non-negligibly, also the neck. Thus the hand-planing (thinning), the bracing (stiffening) and tuning of the soundboard and the back plate become the most important stages in guitar construction, concerning stability of the box (string load ≈ 45 kg!) and tone generation. The soundboard together with the bridge, and not to forget the neck, are the parts of the instrument that absorb the vibration energy of the plucked strings. It is beneficial for the sound production of a guitar if the sound board forms a so-called coupled resonator with the back plate via the vibrations of the air in the cavity of the guitar box. Thus soundboard and back plate have to be tuned to certain fundamental frequencies. The difference of those frequencies has to be in between certain limits, so that conditions for resonance are fulfilled. This can be achieved by tap tuning (with a filt coated wood hammer or knocking with the knuggles) using the ear or a microphone and a computer. The fundamental frequency of the top of a classical guitar of the usual size is adjusted to a frequency in the range f – g#, which results in a strong and robust sound quality of the played notes. The guitars built in my workshop are finished by hand using traditional French polishing: extremely thin layers of blonde or amber shellac (dissolved in ethyl alcohol) are applied by polishing with a cotton/linen pad, the “muneca”. The extremely hard shellac coating is superior to other types of lacquer with respect to tone production. The finish is hand-polished to high gloss. This process takes several weeks and 30 – 40 hours of work per guitar. Copyright (c) fineguitars.se. All rights reserved.